On Tuesday 4 December 2012, 2,500 children from across the Diocese of Westminster celebrated the Nativity story in Westminster Cathedral at the annual Catholic Children’s Society Advent Carol Service. The event was divided into two parties, the first of which was celebrated by Auxiliary Bishop of Westminster, John Arnold at 11am and the second with Auxiliary Bishop Alan Hopes at 2pm. The service incorporated the nativity play which was performed by the children and included a live donkey and sheep. The Christmas story was narrated by an actor, playing the role of Joseph, and included a variety of Christmas Carols. After the nativity had been completed, the Bishops’ gave a brief homily to the children in which they asked the children what did Mary and Joseph bring to Christ, and what can we bring? Speaking about the importance of remembering the true meaning of Christmas after the service Bishop Alan Hopes said: “In the run up to Christmas, parents and carers find themselves pressured into showing their love simply by how much they spend. So I am pleased that the story of God’s love for us as shown at Christmas and in the simplicity of the Crib still attracts and entrances the young”. Paul Winterbottom, at the Catholic Children’s Society, said “it is a great opportunity to bring together children attending Catholic Primary schools across the Diocese...and helps to improve a child’s spiritual development”. 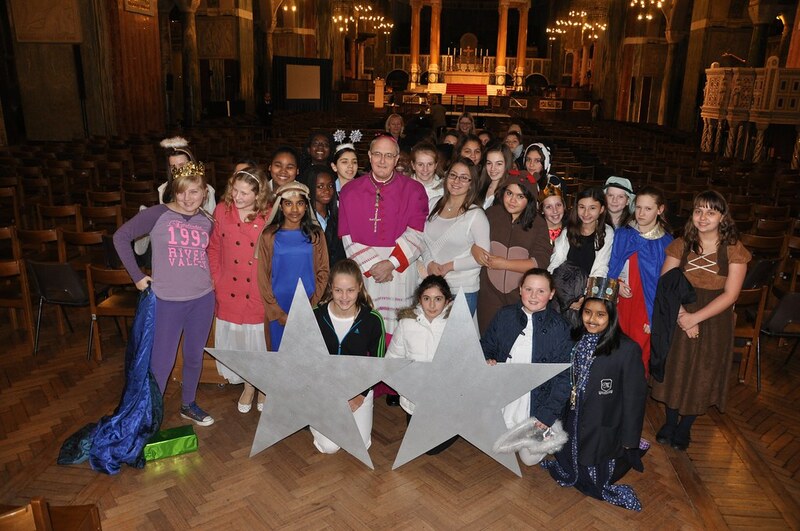 Further photos of the CCS Advent Carol Service are available here.